Wow, where to begin. I'm still on a high, if I'm honest - I graduated this week and I'm still smiling and in genuine shock. I'm not used to waking up and seeing my degree on my wall (yes, I'm that extra that I frame it, and no, I'm not sorry). If I were to be completely honest, I didn't think I'd ever graduate. I always told myself I wasn't smart enough to be there and I doubted my abilities academically. The last three years have changed my perspective on so many things, I can't even begin to comprehend it. It was a surreal moment, waiting in the auditorium and waiting in the wings before my name was called. I was shaking like a leaf, but I was smiling. After the amount of times I've been told I couldn't do something, I actually did it. 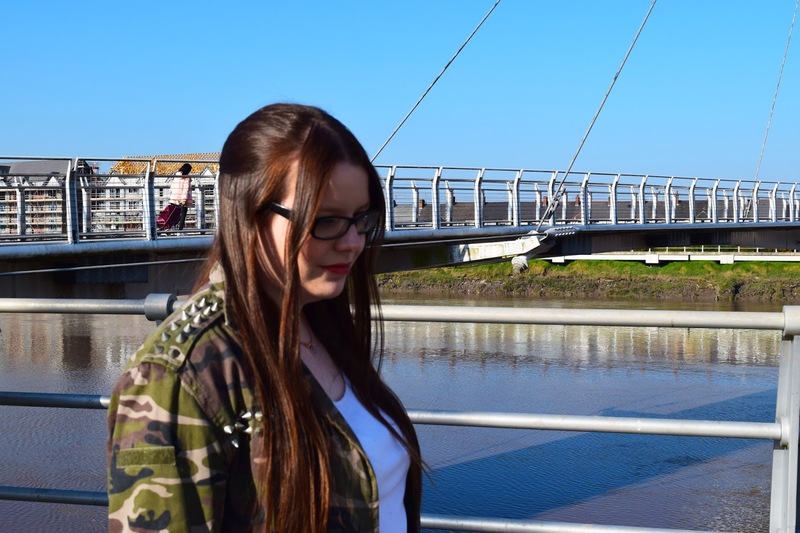 Going to university took so much choice and thought, because dealing with horrific anxiety made this choice so difficult for me. Numerous times in first year I contemplated dropping out and not going back, but there was something in my head telling me to stay. I followed that feeling, and I have no regrets. 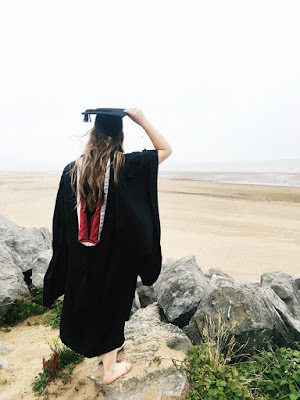 What has being in university taught me? In numerous ways, it's taught me so many different things that I'm forever thankful for. To not have majorly high expectations. I'm only one person with one brain, and I can't expect myself to get everything perfect. I'm human, I'll make mistakes! That no matter how hard things would get, I had an amazing support network and if I just speak out, I can be heard. I won't sugar coat it: the last 3 years have been hard for me, academically, emotionally and mentally. If you're a reader of my blog, you'll know this. I've been faced with so many challenges of various difficulties and through the hardships, I've come out the other end. I'm happier than ever, my confidence has soared... It's like I'm a different person compared to the shy and anxious first year I was. I didn't expect university to be easy, but I was willing to fight and put the effort in needed to be where I am. 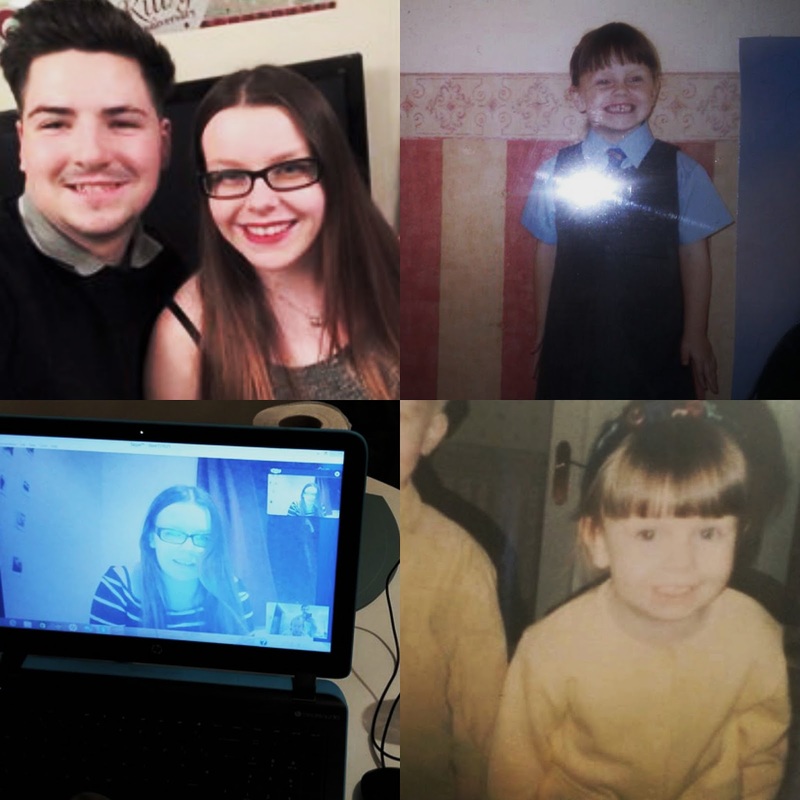 I cannot thank my university, course leaders, personal tutor, family and friends enough for everything they've done for me, from the long video calls home, to having essay meetings that were mainly chats about random things and personal life. It's been an extremely life changing experience, and I wouldn't have changed my time at Swansea University for anything. The pride I have in myself at the minute is overwhelming. People may not think graduating is a big deal, but to me it's meant everything. I put myself down so much, and even others have put me down. This just goes to show that I can do things if I put my mind to them, and I'm bloody good at persevering and giving things my all. I'm proud to say that I'm a graduate. Swansea will always be another home to me, wherever I am in the world and wherever life takes me. Thank-you Swansea University, you've been incredible. For me, taking photos is a must. I don't just mean 'selfies', but I love to capture lovely memories as they happen to keep forever. I know people say "I'll remember this forever", but that's not always the case. Whenever a happy moment happens, I bring out the camera to ensure that the memory does stay alive forever. My camera roll on my photo (and my Google Drive) are filled to the brim of photos, from random occasions such as: going out for a meal with friends, having a fun night out with them, with my family members, my animals... The list goes on and on. It's all well and good to have the photos on your phone/camera, or online, but I love having them physically. The lovely people at Printiki got in contact with me a while ago, and I couldn't resist. There are so many ways to have your photos printed/presented, so I tried to go for something a bit different. The prints I had made were 20 medium sized prints with a polaroid design and a glossy finish*. Personally, I'm a major fan of having photos designed like a polaroid, as it gives it a 'vintage' feel, but also allows for you to write on the bottom - something which I will be doing in the near future. I must admit, I did take a little bit of inspiration from Love, Maisie for how to arrange my photos, because I was just going to have them stuck to the wall. I wanted to do something different, and Maisie's post on her DIY Bump to Baby photo wall was literal genius. I changed up the idea slightly and my mum purchased these fairy lights, where the lights also have clear, plastic pegs attached to them (perfect for attaching photos!). I fell in love as soon as she gave me them, even though she was saving them for Christmas. 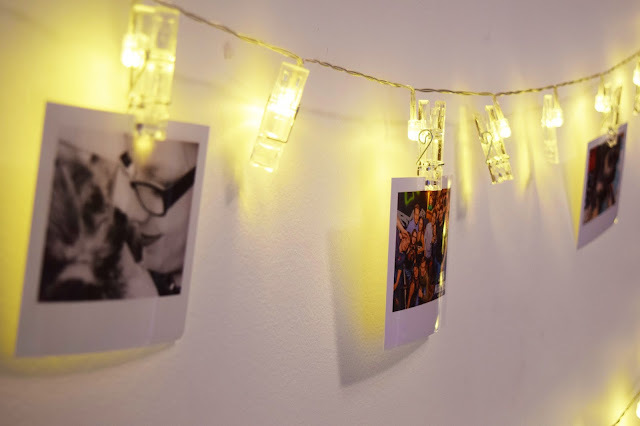 The photos from Printiki and these fairy lights are the perfect combo, as it gives a different edge to having photos displayed, but also helps create a warming atmosphere for your bedroom, living room or wherever you want to put your photos. A lot of the reason I wanted to get photos printed as because in the Summer of this year, my family dog who we had for 11 years unfortunately passed away very suddenly, so I wanted to get photos printed of her (not as a memorial, but more of a memory wall). 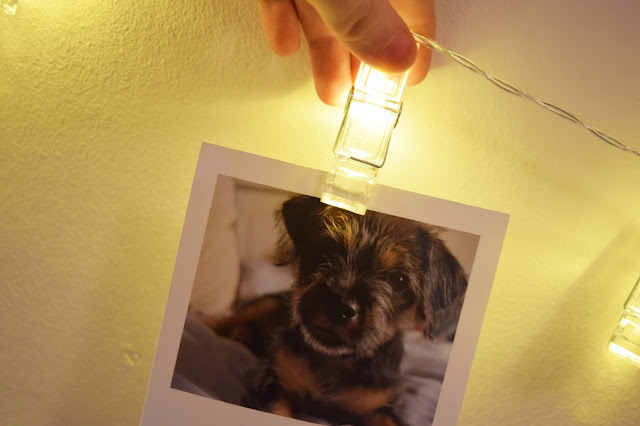 Sadly, I realised that there aren't too many photos of her, because I wanted to have her life from puppy to adult, so I wouldn't have been able to fill the fairy light wall. So instead, I decided to keep it as a memory wall, but to have my most favoured memories. She is included on the wall a few times, but so are me and my friends, my family, and my new puppy, Evie. I prefer having it this way, as I know I'd get upset if I saw a lot of photos of my old dog, so I kept the photos of her to a minimum (she's in 2 of the 20). I can't wait to get more photos from Printiki, as I've never been so happy with the quality of photos in my entire life. I've printed out photos before, and I haven't been too happy with the quality or size, but I'm so happy that Printiki cater for that. Their website is so easy to use as well, and I think from the time of uploading to having the order placed, it took me about 5 minutes. The website also allows you to resize your photos as well as being able to rotate them, which I think is a really good idea, and also allows you to have photos exactly how you want them. As well as this, you can upload photos from your phone, computer or even your social media accounts, like Facebook and Instagram. Fancy grabbing yourself some photos like I've mentioned above AND also getting free shipping? Head over to Printiki and when you're in the checkout process, use the code 8JPYZXPY. I want to thank Printiki for getting in contact with me to work with them, it was so lovely and I'm very happy with the result. I've been debating back and forth in my head for honestly about a year and a half on whether or not I should purchase a FitBit. I know numerous people that own them, but as much as they would go on and tell me how good they were, I wasn't hooked. I kind of viewed them as pointless to own, and didn't really see the obsession with step counting. I mean, that's what pedometers are for, right? I have the Health app on my phone which records my steps, I didn't particularly care for checking how good or bad I slept. However, my mind has changed. I guess the reason I didn't particularly care too much for fitness trackers was because I wasn't too into fitness, but now I have the bug (or plague, I should say) for it, I am literally obsessed. If you follow me on any of my social media accounts, you'll know that during the summer, I took the plunge and purchased a FitBit. The one I went for was a Charge 2 in black, and honestly? I'm in love. I did debate between the Charge 2, Charge HR, Surge and Alta, but I finally set on the Charge 2 after major temptation (thanks Maisie!). One reason as to why I took the plunge was because I don't always have my phone on me, so I'd be missing out on my steps. This sounds kind of a silly reason to purchase a fitness tracker, but I like the exact amounts of workouts to be as accurate as possible, hence why I wanted a FitBit. I know it's not going to be 100% accurate to the step, but it'll be close, and obviously closer than when I don't have my phone on me. It can record your heart rate (I'm quite interested in this as I like to see how it changes whilst I exercise and I'm determined to get my resting heart rate down to 'athlete' level, which I'm almost at), total distance travelled, calories burnt, stairs climbed and minutes of exercise. I like that it's more than just a pedometer, and when you've not really been moving too much, your FitBit will vibrate and give you a nudge to do a few steps to bump up your overall daily score. You have an app which accompanies your FitBit, and you get weekly emails on your progress. It's a whole system that for me, I think is fab. Another reason why I now own a FitBit is because I think over the last 3/4 of a year, my sleeping pattern has changed erratically. It varied from about 2-4 hours a night to 11-13, it was crazy. With the help of my FitBit, it lets me know exactly when I fall asleep and when I wake up, which I find absolutely incredible to be honest. Over the summer, my average amount of sleep was 7.5 hours, which is a perfect amount for me - any more and I'll have a headache all day, any less and I'll be exhausted all day. My FitBit lets me know if I've had enough sleep, if I've been wearing it too loose while sleeping and exactly how long I spent in each sleep stage (which personally, I find majorly interesting). There is also a feature to add friends and you can do daily/weekly challenges for steps, and you can also cheer on your friends with their progress. I think it's a nice addition to the whole FitBit thing, as it's a bit of a healthy competition, and if you've smashed a goal, your chummies can congratulate you. If that's not a confidence booster, I don't know what is. 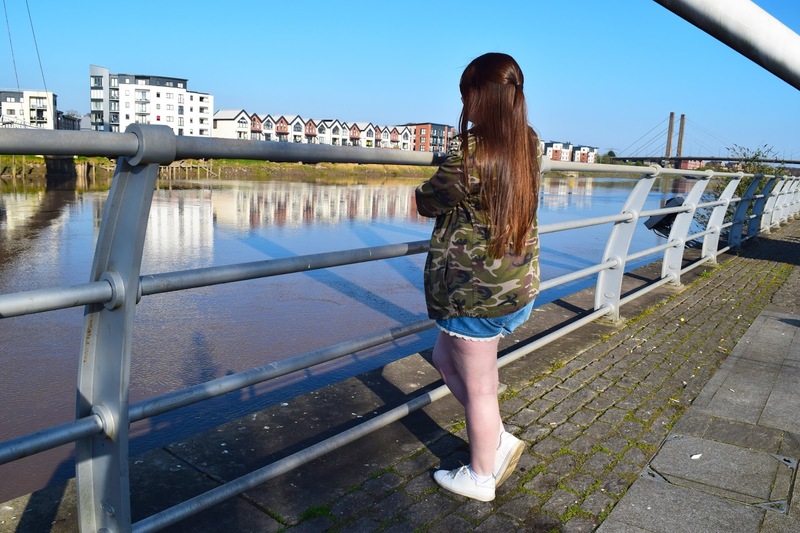 I am in some weekly competitions with other bloggers, and seeing how many steps they do inspires me to push forward and achieve higher. One feature I also like on the FitBit, is that if you turn on your Bluetooth and the notifications option, your calls and text messages will appear on your FitBit. You can't answer them (at least on my FitBit you can't), but I think it adds even more usefulness, and I'll like this feature for when I'm in a lecture and I don't have my phone on my desk, so if I do get a call or a text, I'll be notified. The more steps you take and stairs you climb, you earn badges and trophies. I didn't think much of it at the time, but it lets you look back on your progress. 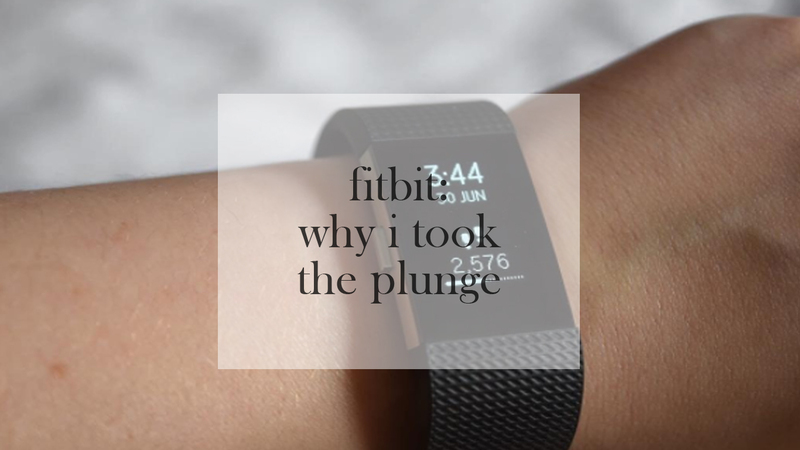 I was quite surprised to see what I had achieved since owning my FitBit, and it did give me a sense of pride and I felt like I had achieved quite a bit regarding fitness and my health. Am I happy about taking the plunge? 100% yes. I don't regret my purchase at all, and I'd recommend a FitBit to anyone. If the price scares you a little bit, maybe try a cheaper alternative first before taking the plunge for a FitBit. There are a variety of prices for FitBits, but obviously it does depend on your budget and the higher the price, the more things you can do with it. Do you own a FitBit? Have you been contemplating it and aren't sure? Let me know in the comments and let's have a discussion! A lot of the time when I'm craving for a snack, I usually want something savoury or something 'unhealthy'. I did want to get into more of a health snack, because I find that my cravings are usually for foods that I know I shouldn't really eat constantly. I do have protein cookies, brownies (and the occasional pack of peanuts or cashews), but I honestly feel like my healthy snack struggle is now over. The lovely team at Acti-Snack got in contact with me a little while ago and they sent me over some samples of their products, and I must admit - I was very excited. For those of you who don't know, Acti-Snack is a "delicious new range of natural dried fruit, nut and seed snacks which maximise on the intrinsic values of each ingredient to meet individual sporting nutrition objectives - carbohydrates for fuel, a combination of proteins, healthy fats and carbohydrates for endurance or protein for recovery - perfect for those who lead an active lifestyle." When the package arrived, I wasn't expecting many samples because I'm not the kind of person who expects to be given a lot when it comes to samples. However, when I opened the package, I was so surprised at their generosity. I was in actual shock with how many things I had been sent, and I was happy that there was a lot of variety there. I'm very thankful that they took time to send me a variety of their products, giving a variety of different flavours for me to try. As someone who is into fitness and finds that sometimes a bit of fruit is a little bit boring to have for a snack (or sometimes I don't find it appealing), I now have the chance to try out something new, and to coax me into eating some snacks that are good for me, and I can reach for something healthy as opposed to a bag of crisps or a little bit of chocolate. I absolutely love nuts, so I'm very happy that a lot of these products do contain them, as they are one of my favourite snacks to reach for. I know the little bags of almonds or cashews will do me good when I'm in a lecture in uni and I need a boost, or at home writing my dissertation and need something to have a munch on. The sizes of each product are so handy, as they're easy to put in your bag or to carry on the go and you've got yourself a healthy snack there waiting for you. Out of all the products, my favourites are: the Nut Mix, the bag of cashews, the fruit, nut & soya snack packs and the fruit, nut & cranberry bar. I'm yet to try any more of the other products, as there are some ingredients I'm not too much of a fan of (e.g. banana and raisins), but I'm willing to give them a try to say that I've tried it, or to see if my tastebuds have changed. 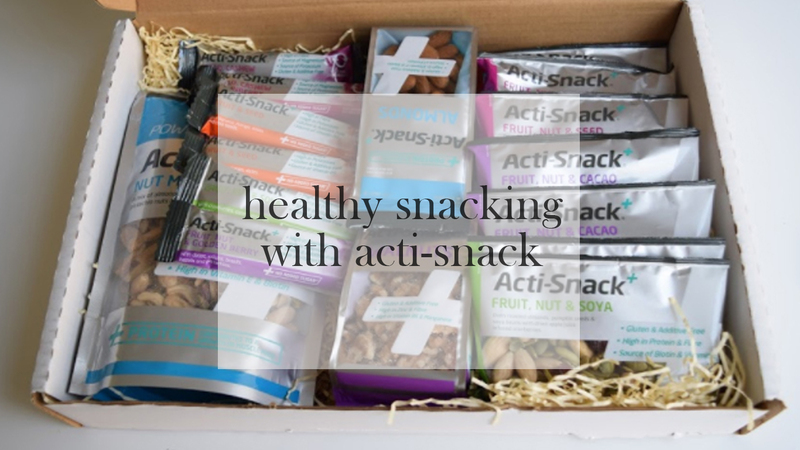 I can definitely say that their products have helped curb my 'unhealthy' snack cravings, and I do find their products to be quite moreish, even when I'm trying to be sparing until I purchase more of the products I love by Acti-Snack. Will I be purchasing Acti-Snack in the future? Definitely. I have browsed their website, and I like the fact they do multi-packs at a decent price on their store. It leaves me feeling happy that I won't be ripped off. Price wise, it reminds me of Graze and their products you can purchase in supermarkets, and a someone who is a fan of Graze, I don't mind paying the price for Acti-Snack, because a) their products are good for you, b) taste great and c) I don't feel guilty for eating them as a snack. Once again, I'd like to say a huge thank-you to everyone at Acti-Snack for showing me about their brand, as well as their generosity with the products they sent me. I hope you've enjoyed this post, and perhaps may check out Acti-Snack and see for yourselves what their products are like! Have you ever tried Acti-Snack before? Were you a fan of their products like I am? What are your go-to health snacks? Let me know in the comments and let's have a discussion! * This is a PR post. The views and comments made by myself on this blog and any of my social media accounts are non-biased and I can confirm I have not been paid to say things that are untrue.